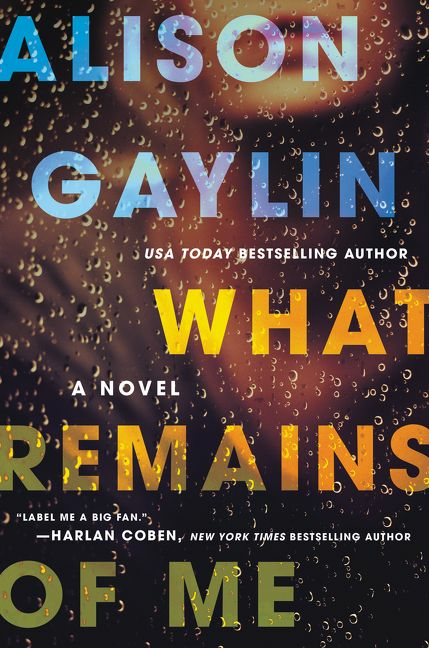 What Remains Of Me by Alison Gaylin is a captivating story. The bestselling author Jeffery Deaver once said, “A thriller asks what is going to happen and a mystery asks what happened.” In this spellbinding story, Gaylin does both through her character Kelly Lund, portraying her as a teenager and a woman in her forties. There are multiple themes explored including the effect of secrets, how money and power corrupt, as well as how the media frenzy attempts to put a persona on a celebrity. These are all wonderfully intertwined throughout this story about the world of Hollywood. The plot alternates between two murders with the suspect being the same person, Kelly Lund. In 1980, as a seventeen year old, she is found guilty of killing director John McFadden. Released after twenty-five years, she attempts to maintain a low profile until five years later when she is again suspected of murdering her father-in-law, a legendary actor, Sterling Marshall. Readers are shown the circus surrounding the coverage of a famous murderer, and are reminded of the O.J. Simpson and Charles Manson cases. In this story, the media casts Kelly in a role that becomes reality to the outsiders. As one of the characters in the book says, “It’s not what you’ve done that matters, it’s what people think you’ve done.” As the plot progresses readers are able to understand the dark secrets, lies, and betrayals caused by power and money. Even though all the characters are dysfunctional, Gaylin does a good job of showing the reasons behind their faults and personalities. Kelly and her friend Bellamy Marshall become more likeable as the story progresses. In many ways they both had rough lives, having faced some very bad knocks. They attempt to hide their true feelings, and become almost compartmentalized with their emotions. In understanding these two characters the fairy tale The Prince and The Pauper comes to mind. Both Kelly and Bellamy envy what the other supposedly has. Kelly searches to replace her twin sister Catherine who died and Bellamy wants her to be the sibling sister she never had. Each looked upon the other’s life and thought how that life could be better than their own. The only character that seems to have some semblance of being grounded is known as Rocky Three. He becomes Kelly’s confidant and someone she can believe in, a friend who offers tenderness, compassion, and truthfulness. The direct opposite of Rocky is the narcissist John McFadden, a truly evil person who uses his power to prey on young girls. This is brought home with the powerful quote, “You ever wish you were a little kid again…too little to understand how the world works?” Readers begin to understand that many children in the Hollywood scene grow up way too fast, and begin to realize that the world is not always a nice place. Anyone fascinated with Hollywood and true crimes needs to read What Remains Of Me. Gaylin uses her journalistic credentials to have the plot and the characters come alive. This emotional,dark, and distinctive tale of revenge and betrayal, presumed guilt and innocence lost, will have the readers quickly turning the pages.